As our own CELT Symposium looms at the end of the week, it seems fitting that I finally reflect on the last conference I attended. This year's EdTech theme allowed us to pause and reflect about TEL in a complex age. Throughout the two day event, it was evident that we are indeed facing challenges, but also using those challenges to create strategies and opportunities. The first keynote of day one was from Gráinne Conole, who is currently a visiting professor at DCU. She focused on the future of learning and harnessing technologies. Her presentation encompassed so much of the landscape and set the scene well for what was to come. In discussing the characteristics of the 21st century learner, necessary digital literacies, the integration of OERs, structures of MOOCS, and the benefits for students; she arrived at a heutagogical approach that allows students more affordances in the Web 2.0 landscape. I really appreciated how such a nuanced idea could sum up the whole TEL landscape so succinctly. It's clear that even in our terminology we can accidentally place the focus on the technology rather than the pedagogy. The Global Challenges in Higher Education session was led by Lawrie Phipps and Donna Lanclos. The discussed Leading with Digital in an Age of Supercomplexity, and namely on the JISC Digital Leaders programme. As a bit of a fan, I get presumptuously excited that Donna was in Sligo, but I was to be disappointed. The second keynote from Professor Paul J. LeBlanc, President of Southern New Hampshire University. He discussed the success of competency based learning at SNHU. He also joked that Americans don't talk about MOOCs as much as the Irish do at an ed tech conference! The Jennifer Burke award went to Antonio Calderón of UL for a fantastic project with initial teacher educators in PE. This project, #CoolPE, is definitely worth looking at, as it could be adapted across sectors and subject areas. On a beautiful Friday morning, we launched into day two of the conference. Mark Glynn outlined Turning off Turnitin. This might sound like a frightening challenge, but Mark was open and candid about the process, and the difficulties they faced. Niall Watts from UCD, again quite candidly, discussed the creation and use of MOOCs in first year Geography to largely positive feedback from students. His slides can be accessed here. One stand out presentation for me was from Sam Cogan of the National College of Ireland, who discussed dual delivery in his lectures. I've flagged this one for follow up, as he seems to be actively and progressively focused on changing the dynamics of the lecture hall. Professor Meg Benke's keynote was refreshing in its reflective nature and its focus on scholarship through the work of Boyer. She discussed the importance of education, communities of practice, and new methodologies in the age of supercomplexity. It was also announced that ILTA would co-sponsor ten people going forward for CMALT certification. In closing, ILTA made a call for members to get involved in the coming year. It should also be noted that submissions are welcome for the Irish Journal of Technology Enhanced Learning. 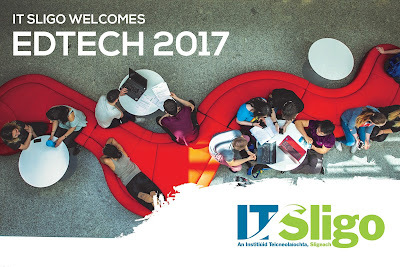 A call for other members and attendees to get involved in @ILTAtweets for the coming year #iltaedtech17 #openness Your community needs you! Reflecting on the two days, it's evident that in age where we as practitioners are faced with complex challenges, that we must remain vigilant and become involved, reflective, and active practitioners. The keynote speakers and presenters at this year's conference are working through challenges and planning for an uncertain future, while focusing on learning and success that is only enhanced through technology. And on a final note, videos will be available soon!